This Saturday Professor Aaron Quigley will deliver a keynote talk on Global Human Computer Interaction at the Thai SIGCHI Symposium in Bangkok. This is the first symposium of the Bangkok ACM SIGCHI Chapter which aims to connect the Thai UX and HCI communities together with those beyond their borders. This talk is part of the Distinguished Speaker Program (DSP) of the Association for Computing Machinery (ACM). In May, Professor Quigley will travel to Melbourne and Sydney Australia as part of the ACM DSP program. First, he will deliver a talk on the Future of Interaction at the Melbourne Knowledge Week followed by a “fireside chat” and panel in the University of Melbourne and finally a seminar in the University of Sydney. 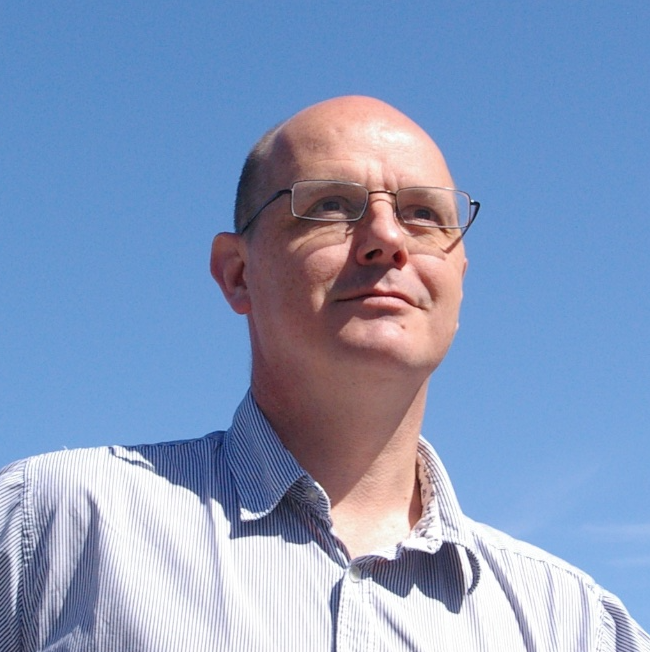 His talks will cover a number of areas of research he explores with his colleagues and students in SACHI, the St Andrews Computer Human Interaction research group. In August, Aaron has been invited to deliver a keynote at the 5th Workshop on ICTs for improving Patients Rehabilitation Research Techniques in Popayán, Colombia. This talk will focus on some of Aaron’s more recent, and unpublished research, in augmenting interactions in AR and his older work on technology for rehabilitation and older people. Professor Quigley is currently on sabbatical in the National University of Singapore but he will attend the CHI 2019 conference in Glasgow this May with SACHI colleagues and graduate students presenting their latest research. Professor Adam Barker is featured in this month’s Communications of the ACM Magazine (CACM) discussing his recent Visiting Faculty appointment at Google. The Viewpoints article summarises his experiences working in software engineering on the Borgmaster team, and some of the core lessons which can be brought back to academia. Borg is Google’s cluster management framework, which runs hundreds of thousands of jobs, across a number of clusters each with up to tens of thousands of machines. Professor Aaron Quigley has been appointed a Visiting Senior Research Fellow in the Smart Systems Institute in the National University of Singapore. As part of his next sabbatical Aaron will spend 6 months in the Creating Unique Technology for Everyone (CUTE) centre in Singapore [Video]. He will be collaborating with researchers there on next generation interfaces, discreet computing and new forms of interaction. The research and lessons learnt will help advance the field of HCI and will be incorporated in future teaching and research here in St Andrews. This week Professor Quigley joined a mission to Japan with other academics from the University of Oxford, Edinburgh, UCL and Manchester. 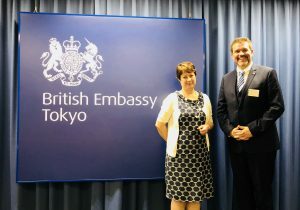 The week long event was organised by the UK’s Science and Innovation team in Japan, part of the Foreign and Commonwealth Office. Over five days the delegation visited and presented at seven companies along with three seminars and workshops. Across nine presentations Professor Quigley presented to hundreds of people and introduced some of the Human Computer Interaction research in SACHI, along with research from the AI research group. This mission has the goal to strengthen research collaboration and innovation partnership between the UK and Japan. During his talks, Aaron provided examples from our engineering doctorate program, our MSc program, work on research interns, PhD students and academics from across Computer Science. 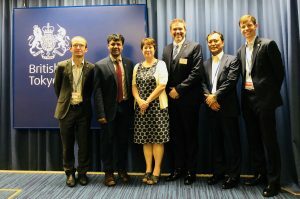 Griff Jones, First Secretary, science innovation & global challenges, Sethu Vijayakumar, Edinburgh University, Sue Kinoshita, Minister Counsellor economic affairs, Professor Aaron Quigley, Seiichi Asano, Senior science Officer and Joesph Robertson, Science & Innovation Officer. Professor Quigley will be a distinguished speaker at the World Usability Day in Tallinn, Estonia this November as part of the ACM DSP. Aaron was appointed to the Distinguished Speaker Program (DSP) of the Association for Computing Machinery (ACM) earlier this year. The DSP brings together international thought leaders from academia, industry, and government. In Estonia, Aaron will present a talk on Global Human Computer Interaction. This is the study of HCI when considering global challenges, languages, concerns, cultures and different economic drivers. This talk explores new technologies and the next generation of interfaces beyond the desktop, in a global context. The World Usability Day was founded by the User Experience Professionals Association (UXPA) and the theme for 2018 is “Design for Good or Evil”. It brings together UX professionals and the topics range from usability to user experience, and innovative technologies to studies in human computer interaction. This is Impact talk as a “brown bag lunch” (i.e. you bring your lunch if you wish) and the school will provide cakes. Xelect was founded 5 years ago by Professor Ian Johnston and Dr Tom Ashton to provide genetic services to the global aquaculture industry. The company built on several decades of research in fish physiology and genetics which was funded by BBSRC through to the stage of commercialisation. Xelect develops genetic selection technology and provides associated laboratory support to breeders of finfish, shellfish and shrimps and to date has served 52 customers in 17 countries. We currently manage broodstock genetics programs for producers in Chile, Scotland (Atlantic salmon), Croatia, Greece (seabass and sea bream), New Zealand (King salmon) and Vietnam (Barramundi). The company started out in incubation space at the Scottish Oceans Institute before moving to independent premises in 2016. Xelect also has sales offices in Puerto Montt, Chile and in Hong Kong. The company employs 12 people, mostly PhDs, and is account managed by Scottish Enterprise. Xelect’s shareholders are the founders, the University, SalmoBreed A/S and the EOS Technology Investment Syndicate. Ian Johnston is former Chandos Professor, Head of the School of Biology and Director of the Scottish Oceans Institute. He currently works full-time for Xelect but retains a 0 FTE position as Professor of Biology.